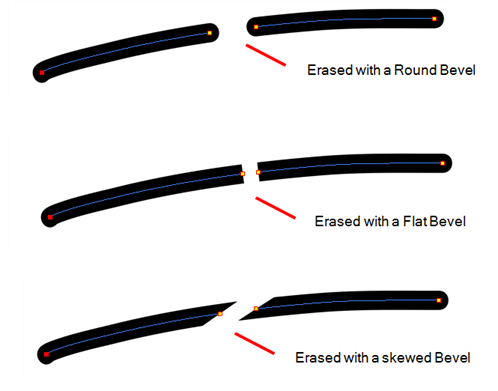 The Tip Style option affects the erased tip of pencil lines made with the Pencil, Ellipse, Rectangle, Line, and Polyline tools. 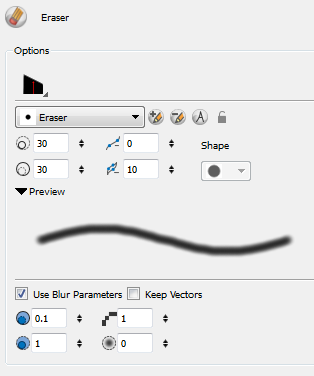 You can optimize the Contour Line Smoothness of you line using this option. This parameter will smooth the contour of your line once the line has been traced, the higher the value the less control points will compose your line. 1. Smoothness field: Type a value to set the smoothness of the line. 2. Contour Optimization field: Type a value to set the contour optimization of the line. 3. Up/Down arrows: Use the up and down arrows to set smoothness value. 4. Up/Down arrows: Use the up and down arrows to set the contour optimization value. In this drop-down menu, you can find a variety of tip shapes from round and square ones to star shaped, select the one you need. The Preview field lets you see a preview of the style that will be produced after you customize the different parameters in the Tool Properties view. 1. The Arrow button lets you show or hide the Preview area. 2. The Preview field is where the brush line is displayed.